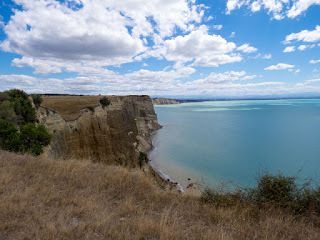 Rather than sampling the art deco delights of Napier, today I went to Cape Kidnappers (about 45 minutes away) to see the largest mainland colony of gannets in the world. To a non-birdwatcher like me, this might not sound particularly appealing, but having been there I can heartily recommend it. 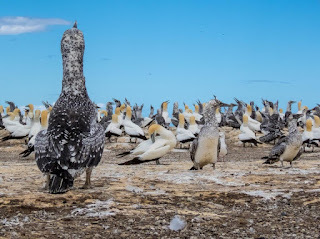 Because, the main things that struck me, were just how many of these greedy gannets there were – literally thousands of them; and how close they were – we were just a couple of metres away from the edge of this enormous colony. This proximity meant that we had a real assault on our senses – sight, sound, and particularly smell. 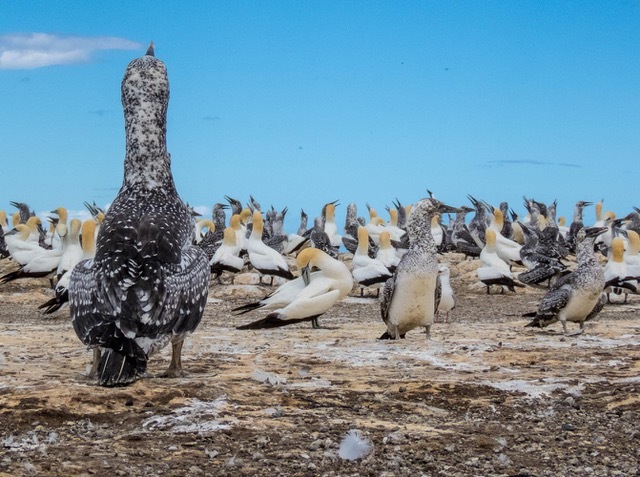 The noise of the colony was amazing – thousands of high-pitch calls, coos, cries, and other guttural noises melding together into a glorious cacophony. While, the smell left by thousands of gannet bodily functions was fairly dreadful too – an acidic, fishy guano-stench that took a while to get used to. But, the sight of an active colony at work was almost to take in – chicks scanning the air for their next feed. Mothers being constantly nudged by their chicks for a stomach-ful of fish. 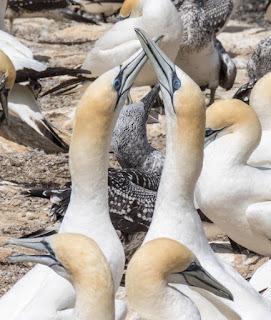 Mothers disgorging a quantity of semi-digested fish mush into the open mouths of their expectant chicks, like a pair of overly amorous teenagers who have just discovered French kissing. 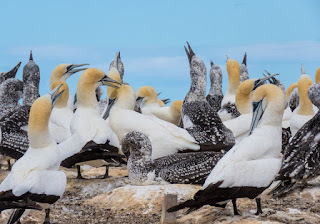 Pairs of adult gannets (who mate for life) sensuously rubbing necks together in a graceful greeting ceremony. Plus, repeated wing waving and nodding (like an OCD ritual) in a dance that no-one has worked out its significance. It was truly fascinating to watch. Considering their reputation for being greedy food-guzzlers, we actually saw surprisingly little gannet-like feeding – perhaps because most of the chicks weren't too far off being fully grown. 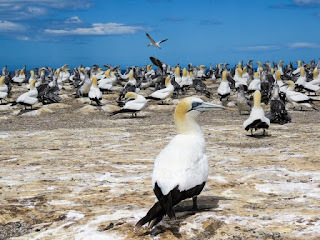 But, for me, the best bit was when the gannets would come to land. When you see them soaring in the air they float around gracefully, however when they come into land it's like they've just been handed the controls of an aeroplane for the first time but haven't had time to read the manual. The number of comically violent crash landings we saw was amazing – often landing head first and taking minutes to come to their senses, and then pretending that this indignity had never happened. Great to watch. If all bird-watching experiences were as action-packed as this, I might become a twitcher.